Health Zone Turkey: How to Reduce Bruising and Swelling After Nose Job? How to Reduce Bruising and Swelling After Nose Job? 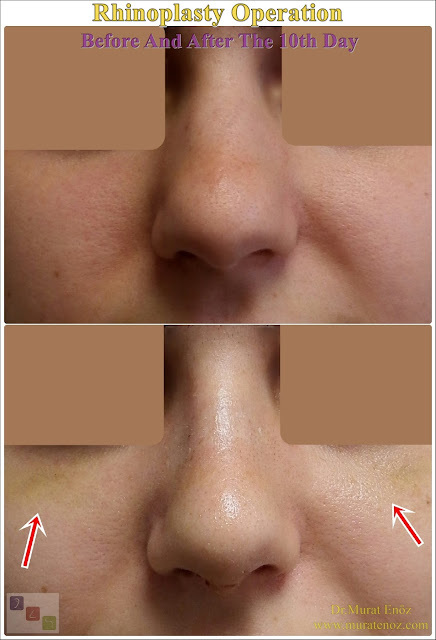 Bruising And Swelling After Nose Job - Rhinoplasty Recovery Information - How To Perform A Cold Spplication After Nasal Aesthetic Operation? 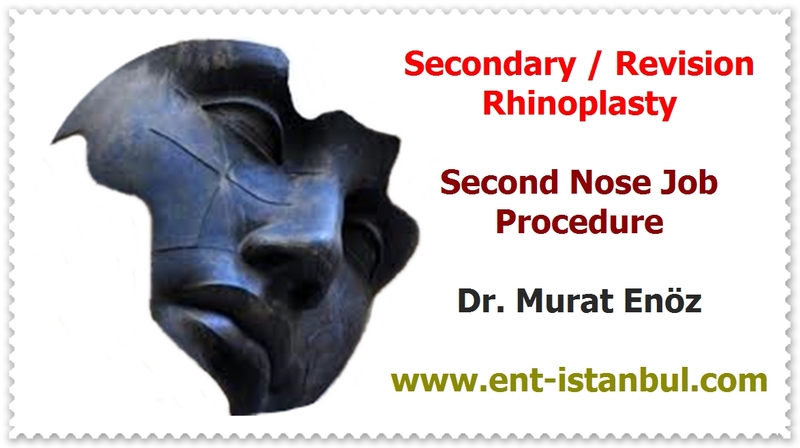 - Nose Aesthetic Operation And Season Selection In Istanbul - Nose Re-Shaping In İstanbul - Nose Job Operation In İstanbul - Rhinoplasty In Istanbul - Natural Nasal Aesthetic Operation - Aesthetic Nose Surgery - A Herbal Product Obtained From Arnica Montana Flower: Arnica Gel / Arnica Cream - Drugs That Increase Bleeding Risk When Used Before Nose Aesthetic Surgery - What Are The Benefits Of Massage And Massage After Nose Aesthetic Surgery? - Summary Of What To Do To Reduce Edema And Bruising After Nasal Aesthetic Operation! - Hilotherapy System (Hilotherm): Ideal Cold Application Method After Nose Aesthetics - Nose Aesthetic Operation And Season Selection In Istanbul - What Can Be Done In Order To Reduce Bruising And Swelling Before Nose Job Operation? 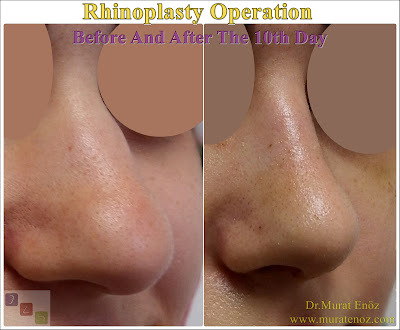 - What Are The Situations That Can Increase Bruising And Swelling After Rhinoplasty Operation? - Cold Sterilized Serum And Ice Application On The Nose During Rhinoplasty Operation - Why Does Edema And Bruising Are Seen After Nose Job Surgery? Nose job operations or rhinoplasty operations are surgical procedures aimed at making the nose better aesthetically and functionally. Two basic techniques, open and closed, are used; there are a variety of modified techniques among them. Along with the nasal aesthetic surgery, deviations surgery and turbinate radiofrequency operation can be performed. Nowadays, aesthetic nose surgery is performed to obtain a more natural appearance (natural nasal aesthetic operation) and to have a breathable nose. In the left two patients, open technique rhinoplasty was performed and nose photographs were seen 3 weeks after surgery.Two patients in the photo you see on the side; open technique rhinoplasty operation, septoplasty operation and turbinate radio frequency operations have been performed. The bruise on the bottom of the eyes and the swelling of the eyes are considerably diminished, and the color change seems to disappear. 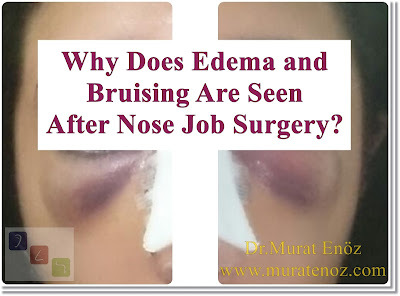 Edema and bruise can occur in varying amounts depending on the technique used after the aesthetic nose operation, the duration of the operation, the healing properties of the patient's body, the materials and many other factors. The suggestions presented in this article are suggested by Dr.Murat Enöz, which will accelerate the healing of facial palsy and bruising under the eyes, which may occur after the operation of nasal aesthetics. Other physicians and clinics may have their own unique and specific applications. Please note that your doctor advises you. 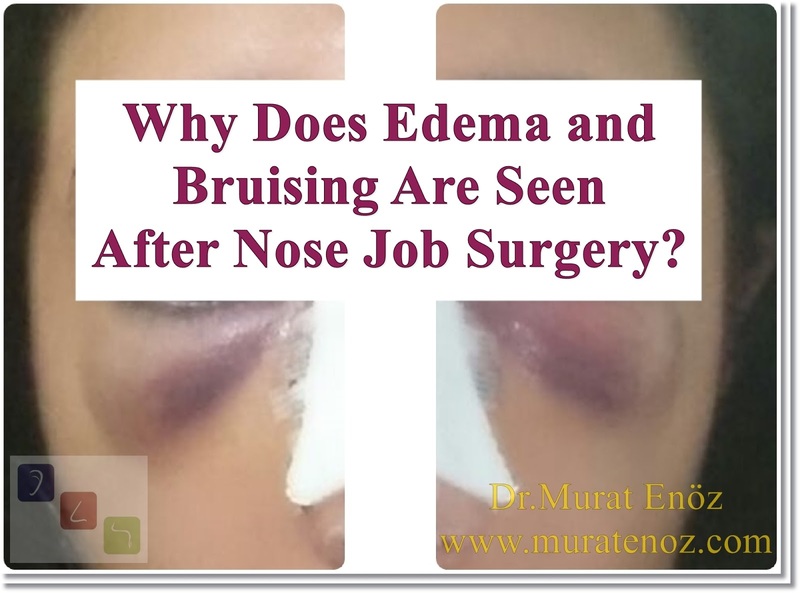 Why Does Edema and Bruising Are Seen After Nose Job Surgery? During the operation of nasal aesthetics, the nasal bone and cartilaginous nostrils are found in various interventions (rasping, fracture formation ...) in varying amounts depending on each patient. Membrane of the nasal bone (periosteum) subcutaneous tissue and skin in the same way is affected during these interventions or less.After rinsing, all the tissues surrounding the nasal bone during the rasp of the nasal bone area are more or less edema after operation. Depending on the size of the operation performed on the bone, blood may leak to both sides of the nasal bone and to the undersurface of the nose, so moration may occur in these regions. Nasal aesthetics is a cosmetic and functional application made on the nose. Even if it is done because it may have a positive effect on the appearance of the patient and the quality of life; our body perceives it as a trauma. In other words, it is inevitable that the repair operations in our body will come into effect as it is after surgery all applications.In all operations performed on the nasal bone and the following cartilages, the vessels, part arteries and lymph vessels in the nose are damaged. Otherwise, subcutaneous tissue may be damaged during rasp; bone grafts are also damaged during removal of bone grafts before rubbing over the bone. In other words, more or less tissue is affected. As seen in the video, frozen sera containing sterile isotonic pre-frozen is applied directly on the nose. What Are The Situations That Can Increase Bruising and Swelling After Rhinoplasty Operation? Resting in a continuous lying position can also have negative effects on blood circulation and tissue healing, as lymph fluid collected at the nose edges can reduce recruitment. I am suggesting that they walk in the windy weather, particularly in the late evening when they are sick after the nose surgery. After nasal aesthetic surgery, the first days of extreme hot food defeat and the proximity of the vapor of these foods to the face may increase bruise and swelling. Likewise, washing the body with excessively hot water and bumping into the face area of this hot water vapor will also increase bruise and edema. What Can Be Done in Order to Reduce Bruising and Swelling Before Nose Job Operation? The use of blood thinners before nasal surgery is inconvenient and may increase blood leaks from injured tissues. It is advisable to cut off medicines that prevent blood clotting before the operation of nasal aesthetics. During the menstrual period, the risk of bleeding may increase and it may be appropriate to plan the operation after the end of the period. The risk may increase and it may be appropriate to plan the operation after the end of the period. In warm seasons (especially in August), patients who plan to have a nasal augmentation surgery should be very careful. In warm air, the nasal vasculature enlarges, bleeding and tissue edema may increase. For this reason, it is ideal that the patients scheduled for surgery in these seasons should be in a cool room environment after the surgery, especially during the first week, and should not go out between 12:00 and 14:00 noon. How to Perform a Cold Application After Nasal Aesthetic Operation? Cold application after nasal aesthetic surgery may be the first 24 hours after surgery and the first 12 hours after surgery. Cold application after aesthetic nose surgery can reduce bleeding and swelling in the surgical field, and decrease the activity of pain receptors. Otherwise, if cold application is done wrongly, lymphatic circulation defect, wound healing may be adversely affected and ischemic damage may be caused. Ideal for cold application is fixed at 15-20 degrees. These negative effects are more severe especially in continuous cold application under the 5 degree tempratures. Ice Application Is not an Ideal Cold Application Method? After the nasal aesthetic, immediately after the operation the head of the patient is raised and the cold application is performed. Ice application can be done by filling the gloves or using cooling glazes kept in the freezer. In this case 45 min cold application and 15 min break is the standard application. In this way, when the surface is touched and the ice is applied at a temperature of at least 0 degrees, the temperature gradually increases and a cold application which is not at the constant temperature is provided. There are various negative effects on the application of the nasal zone at temperatures below 15 degrees Celsius. Hilotherapy System is a system developed to reduce tissue edema and moration after aesthetic nose operations and allows cold application at constant temperature. It is constantly warm and constantly watered through the mattress sitting on the surface of the honeycomb. This system is not available at every hospital. As a common practice, ice compress application is preferred. Arnica is a product of the "homeaopathic" drug group derived from the essence of Montana Flower, which is free of chemical substances, which can be used for edema, bruise and muscle damage. For this reason it is argued that it can be easily applied to the face. You can find incorrect and inconsistent information about this product on various blogs and women's pages on the internet. It is recommended that this product be applied in a small dose and a solid skin area in the face area. 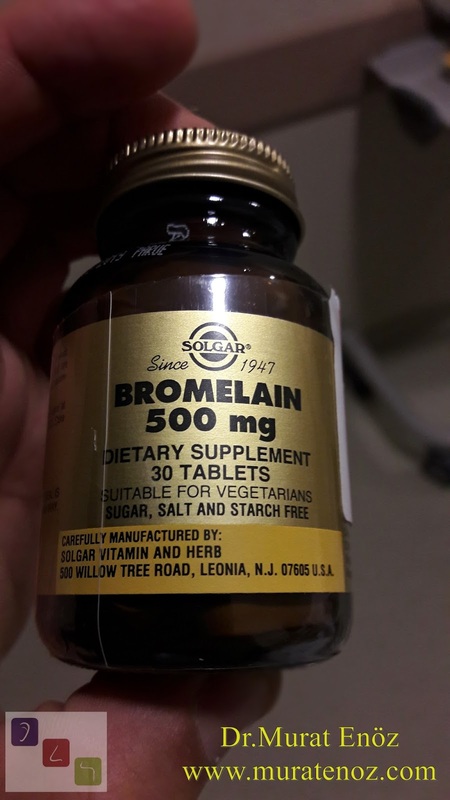 In addition to this product, there are also products that help to reduce edema and purple, including "Bromelain" or "Bromelain + Arnica Montana Extract". It is recommended that allergic people should be cautious when using these product-like gels and creams. 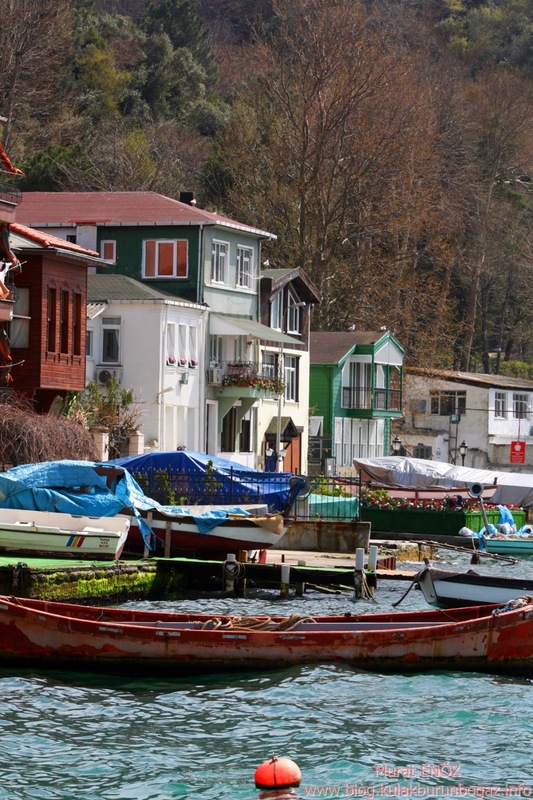 Products containing Arnica Montana abroad have standardized post-operative clinics. 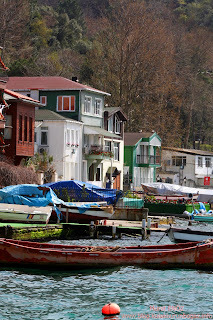 Postoperatively, the first week was only at the cheek area near the atelin; After the second week, I recommend massaging Arnica Gel 3 times a day on the nose and on both sides of the nose. There is debate about the use of Vitamin C and Vitamin K, which have beneficial effects on tissue healing and bleeding clotting prior to nasal surgery. It is not a routine practice. 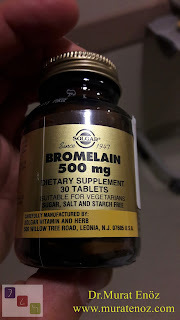 Oral administration of these vitamins before surgery is not a standard practice. The under-eye skin is very intricate and the application of products containing vitamin-like ingredients to these areas can cause problems due to the risk of excessive absorption. Some medicines and herbal supplement products have a negative effect on bleeding clotting before nasal surgery and may increase the risk of bleeding during and after surgery. Patients using these medications may have more post-operative custodial purpura and nose bleed risk. What are the Benefits of Massage and Massage after Nose Aesthetic Surgery? In nasal surgery, there is usually a reduction in the volume of the nasal bone and cartilage, without reducing the volume of the deep nose. For example, in a patient with nasal hump removal, the skin surrounding the nose is now more abundant than the nose and at the same time the subcutaneous tissue is also swallowed due to operative trauma. Nasal massages made after nasal surgery can be used to reduce these edemas, to spread asymmetric healing tissues on the nose, and to increase lymphatic circulation. Nasal massage is planned according to the patient and it is suitable for the patient to be shown to the patient by the physician and massaged without harming the reconstructed support tissues. Summary of What to Do to Reduce Edema and Bruising After Nasal Aesthetic Operation! - Late in the evening after surgery, walking in the windy weather. Waiting in a continuous lying position may adversely affect wound healing; lymph fluid accumulation in the face area and tissue edema.